download the ScreenSaver (v 1.5) here! 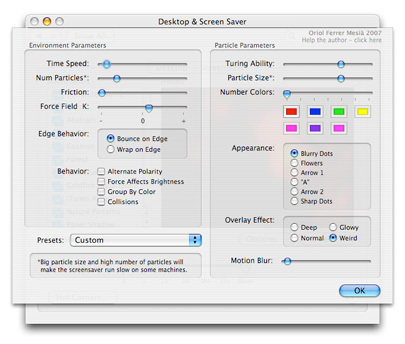 Fields is a small force field simulator for Mac OS X in the form of a screen saver. Particles react to each other creating interesting visual patterns. Lots of parameters can be set to achieve different visual results in the simulation. Launch it, and play with the parameters! It's possible to go to fullscreen mode. The screen saver just requires to be double-clicked. Many thanks To Hansi Raber for his wise comments. Slow computers might need to pull down the number of particles to keep the simulation running smooth. each time... Please download again! -Fields has now taken the form of a screen saver! The videos don't make any justice to Fields; it rus very smoothly at 60 fps making the motion way more fluid.